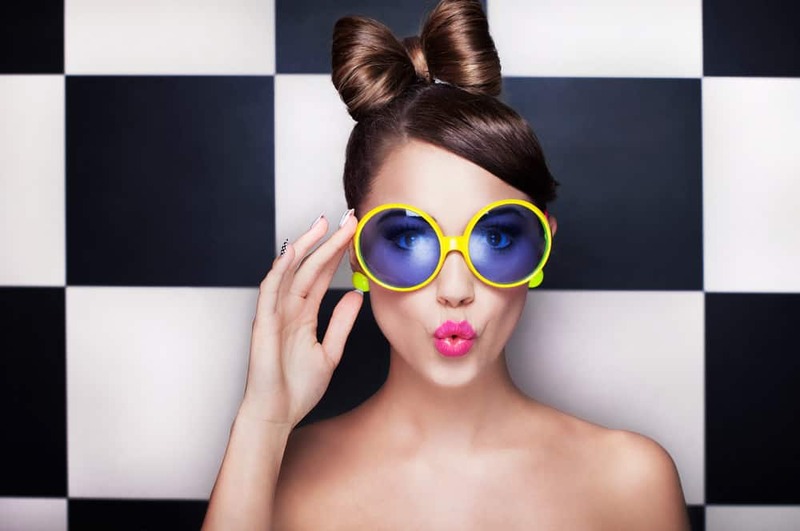 The bun hairstyle is a classic for women and men. There are all kinds you can do such as low, high, braided, double and others. They help keep hair out of your face while being a little more elegant than a simple ponytail. Below is a large and growing photo collection of many different types of bun hairstyles for women. Enjoy. Here’s Amanda Seyfried sporting a tight low bun with her infamous long blonde hair. Looks great with silver earrings and chic green dress. I love this pose which is a great candid photo of her. She has a terrific natural smile on her that’s engaging the viewer. It’s no wonder she’s a top-tier actress the way she exudes such personality in a photo and on the screen. This is a classic look for any formal occasion. Amanda Seyfried wears this low bun or “chignon” with a deep side part in the front. Make sure to straighten the hair and use gloss spray to finish. Zendaya rocking this look on the red carpet is proof that top knots aren’t just for sweatpants and hoodies. Use a brush to smooth the back, sides, and top to create a high and smooth ponytail. Wrap around into a topknot and secure any loose pieces with pins. Working with your natural texture can make a beautiful up-do. 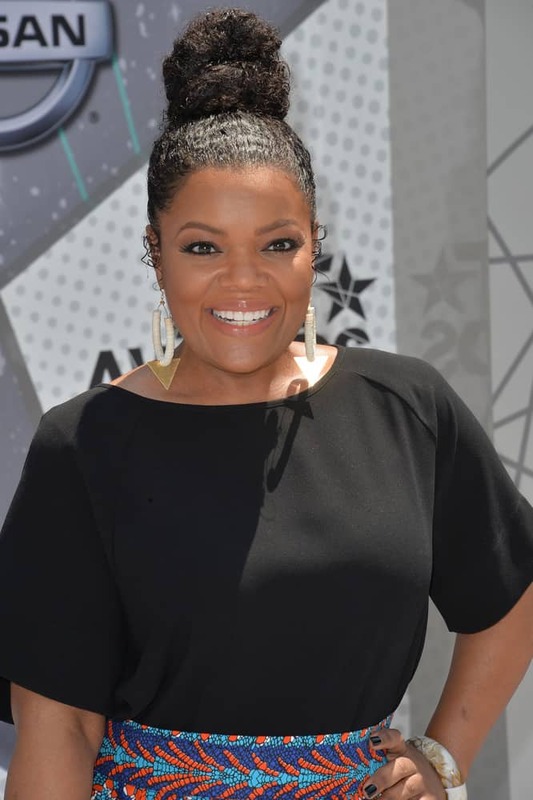 Take a cue from Yvette Nicole Brown’s style and add some moisturizing hair serum before brushing your hair up into a hair tie. Loop your hair through once and wrap the ends around the base. Fan out the loop to finish the look. Stana Katic’s perfectly undone ‘do is part ponytail, part bun, and all style. Finger comb your hair into a high ponytail and loosely wrap into a bun. Tousle the bun and pull out a few pieces. Use a texture paste to separate the ends. Leave it to Sarah Jessica Parker to inspire yet another fashion choice. This braided bun is worthy of a princess. Brush your hair back into a ponytail making sure your hair is nice and smooth. 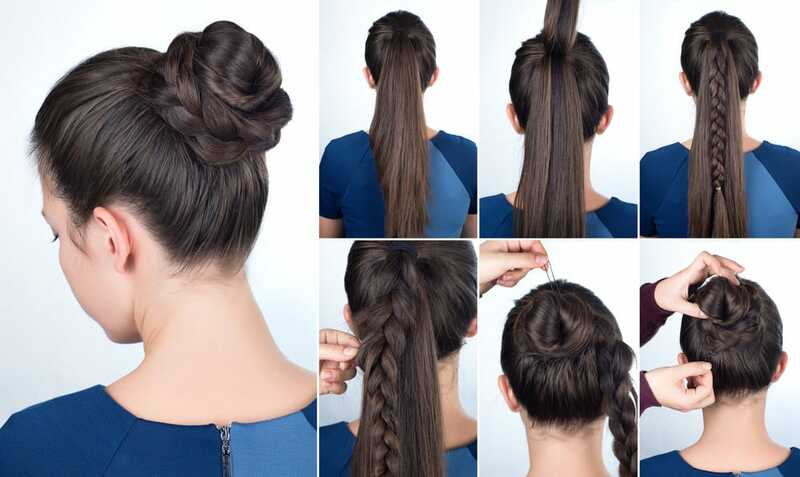 Braid the pony and wrap it around the base. Secure with pins all around and tuck the ends under the bun. Penelope Cruz has timeless style, and the hair to match. Start with plenty of root spray and gently back-comb the crown to get as much volume as possible. Then carefully brush the hair into a bun, taking care not to press down the volume. Finish with a gloss spray. Kelly Ripa’s laid-back look goes perfectly with a simple, modern dress. The hairstyle is a low side bun with a smooth, deep side part and a few face-framing pieces pulled out to soften the style. Add an extra dose of glam to your look with this beautiful braided bun. If you have very long hair you can simply pin around as you go so that the bun gets wider to create this effect. If you have shorter hair, braid sections and then wrap and pin each section for the same look Jessica Simpson has here. Jessica Alba has amazing low-key elegance that you can achieve. Part down the middle and make a simple crown braid to about 1 inch behind the ears. Wrap your hair into a loose, low bun and pull out a couple of pieces to braid and tuck back in. If your hair is dyed blonde like Jennifer Morrison’s then sometimes you need to give it a break from harsh heat styling. This is a great alternative. Do one small braid over the ear, then sweep the hair into a smooth, high ponytail. Wrap into a sleek bun and tuck in any loose ends. Jade Jones hairstyle is young, fresh, and easy to do. Flip your hair over and gather it high on your head. Loop the hair through a hair tie leaving a few inches out. Fan the loop and pull out a couple of strands just in front of the ears to frame the face. If you like bold fashion like Jada Pinkett-Smith’s red dress then a simple up-do is all you need. 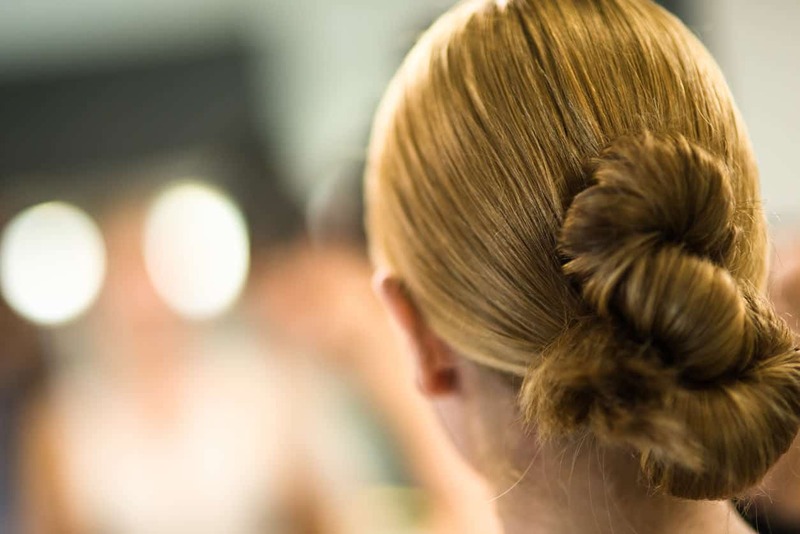 Brush back into a tight ponytail, then gently twist as you wrap the hair around to create a classic ballet bun. Tuck in the ends and use a rattail comb to gently loosen the bun and add volume. If you lighten your hair like Hilary Duff then you’ve got some added texture to work with. Use it! This style is simply a high, messy top knot that’s slightly pulled apart to create that piece-y texture. Heidi Klum pulls off this over-the-top elegance with panache! Use a bun ring to create a voluminous, large bun around a ponytail at the crown. Pull out one piece and use it to wrap around the bun once you’ve got it in place. If you have fine or thin hair, then this is a good look to try. Hayden Panettiere’s stylist brushed the hair up into a tight, high ponytail and wrapped the ends into a smooth bun. 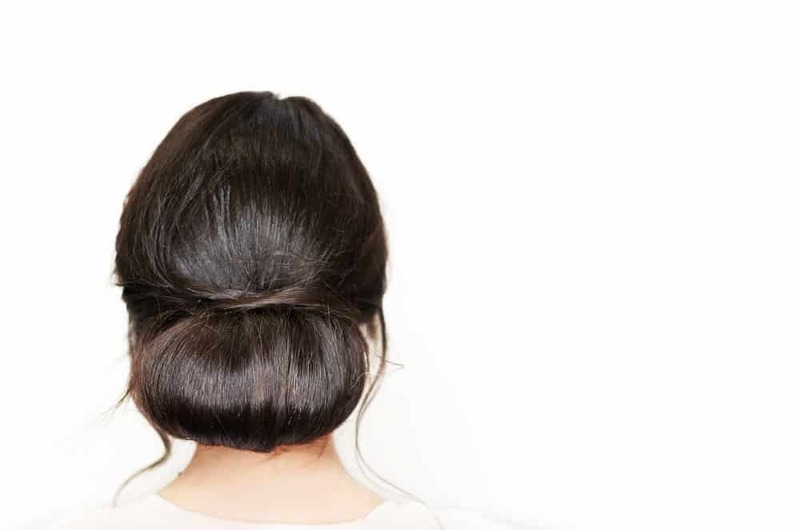 Pull apart slightly to add a little volume to the bun and finish with a glossing spray. If you have bangs or short front layers like Freida Pinto then this is a great solution. Pull the front pieces back like a half-up style, then wrap the back into a low, wide chignon. Highlights and lowlights like the ones Emma Samms is sporting can give a bun lovely dimension. Make sure to twist and wrap to really showcase the color. Elizabeth Banks is no stranger to daring style, and this up-do is no exception. Use a deep side part in the front and smooth the hair. Wrap the ends into a low bun, but instead of tucking the ends under pull them out and fan them a bit. Finish with some texture paste to separate the ends. You’d never know that Carey Mulligan has short hair with this style. If your hair is too short to pull back into one bun, try a couple! Twisting pieces back keeps them from falling out. Just use plenty of pins to secure each bun in place. Bangs and buns can go together, especially if you’ve got eye-grazing fringe like Beth Behrs. The trick is to keep the style sleek. Straighten the hair and pull it up into a very high ponytail. Wrap the ends around into a neat but soft bun. Bai Ling is known for her unconventional style. If you’re this brave then go for a big, bold bun. Unless you have dreads or very long hair you’ll probably need a bun donut to get this much volume. Wrap the hair around and piece it out, using hairspray to build volume and keep everything in place. How popular are bun hairstyles? As you can see this style is trending upward quite nicely and has been for some time. 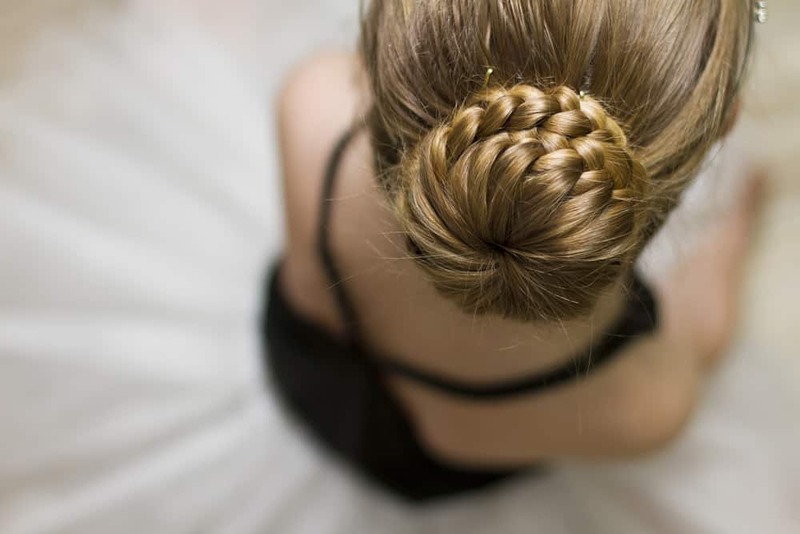 Ballerinas need to be able to keep their hair out of their face while they are dancing, which is why this is such a popular hairstyle, but it isn’t only worn by dancers. If you want to look like a ballerina and enjoy the same hairstyle, then you need to make a very ordered and tight chignon that is in the shape of a donut and located either at the top or the side of the head. This is a great option if you want to make sure that your hair is kept out of your face and looks nice and neat. One key to making sure that your bun looks like a true ballerina bun is to keep any flyaways smoothed down and pinned in place. It can be very difficult for people who have shorter hair to achieve this type of bun. Low buns are worn at the nape of the neck and are generally not very fancy, although you can use flowers or hairpins to make them look a little bit more decorative. While most types of bun look best when there is plenty of long hair to style and to form into the bun, this type of bun is a good option for people who have shorter hair and still want to be able to put their hair into a bun. People with shorter hair will need to use hair pins or bobby pins to help keep their strands in place, while people who have longer hair can hide the pins inside the bun where they won’t be as obvious. If you want to get your hair up and off of your neck, but you don’t want to look like you have tried too hard, then a messy bun may be a great option for you. This type of bun is typically worn high on the back of the head or even on the top of the head, and all strands of hair are tucked up into it. Part of the appeal of this type of bun is that it doesn’t matter whether the strands hang out or if the bun is perfectly smooth. While some people like to wear this type of bun out and about, others rely on it as a quick and easy way to get their hair out of their face when they are in a hurry. This is the simplest of all types of bun and is the basis of many different types of buns, including low and ballerina. A chignon bun is very functional as it will trap all of the hair on your head and keep it off of your neck and from falling in your face. Additionally, this type of bun is a classic bun that can be dressed up for a fancy event or quickly put into place with a simple hair elastic. While some people think that a chignon tends to be very plain, they are often worn in weddings as the hair can be wrapped intricately around the bun for a fancy and impressive look. Braided buns are made in the same way that chignon buns are, but instead of relying on loose hair to make the bun, you first need to put your hair into a braid. Make sure that you secure the end of your braid with a rubber band so that the hair will not come loose after you have formed the bun, which will cause you to have to start from the beginning again. You then coil the braid around itself to form a bun on the back of your head. While it may be tempting to secure the bun using a rubber band, this will cause the bun to compress and look misshapen. Rather, rely on bobby pins so that you can pin the bun into place to keep it from unwinding. This type of bun is very popular for use in a wedding or at a fancy dance, such as prom. While it is very similar to a chignon bun, the floral bun has a few differences. To make this type of bun you first need to coil some of the hair into the correct bun shape. 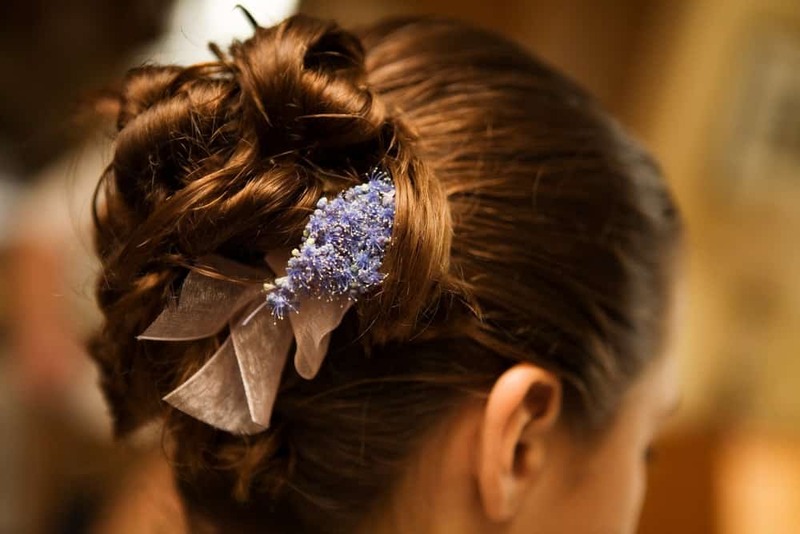 Once this is secured to the back of the head, pieces of hair are twisted around and then attached over the bun, which creates a 3D floral look that is very attractive and interesting. If you really want to make this bun live up to its name, then it is a good idea to include a flower pinned near the bun. This is a very high chignon that is allowed to remain messy and bloated, which makes it look like the person wearing the bun has a lot more hair than they actually do. When worn high up on the back of the head or even on the top of the head, it is very easy to embellish this bun with hair accessories to draw attention to it and make it look even more impressive. This bun is often embellished with flowers, bows, and ribbons to complete the look. Because it is not as imperative for the hair to lay flat with this type of bun, it is a great option for people in a hurry who want to style their hair and get out the door. If you want to elevate your messy bun a little bit to really complete your outfit or make it look like you put a little more effort into your style, then you will want to consider a bohemian bun. 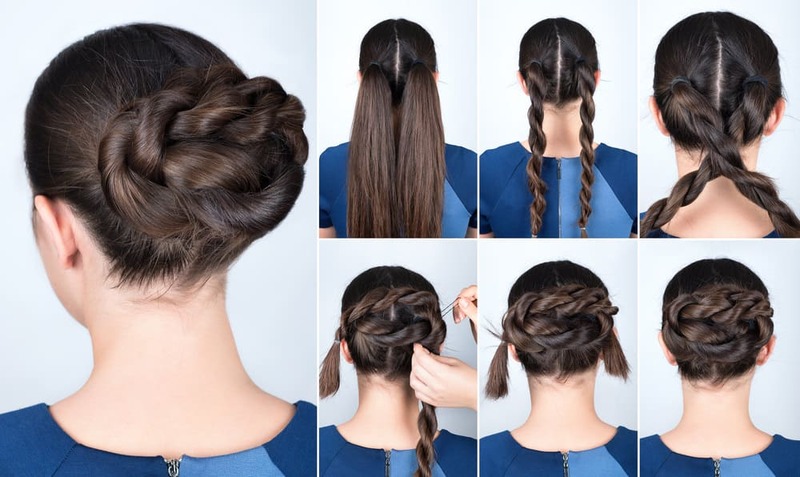 Before forming the bun, you first need to take some hair and braid a long braid, leaving it out of the bun when you secure it on the back of your head. This braid is then wrapped around the base of the bun and secured so that it will remain in place throughout the day. 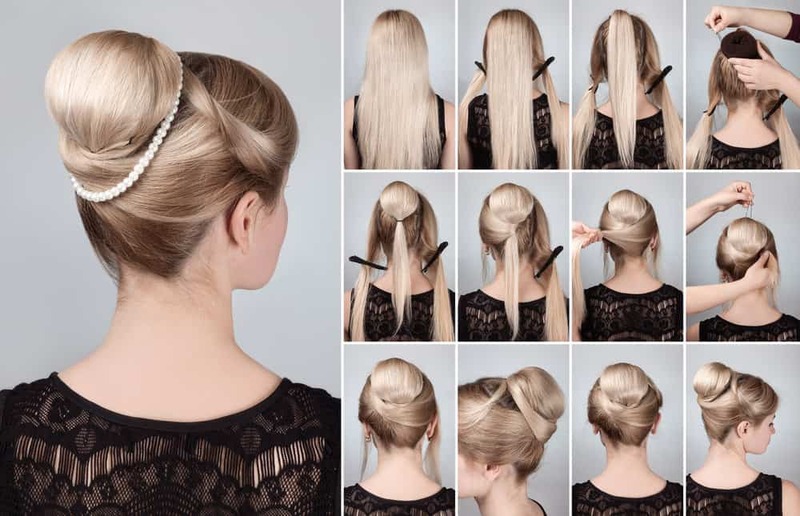 The braid is a great way to hide any pins or bands that are used to hold the bun in place and will help to make this bun look a little bit more impressive. This type of bun is a great way to enjoy the benefits of having your hair in a bun and out of your face, while adding a little personal style to your hair. Rather than forming the hair into a round bun on the back of your head, you first need to secure your hair into a high ponytail. Leave out a strand of hair that you will use once the bun is formed and then form a loose, yet sleek bun. Any stray strands of hair will prevent this bun from looking its best, so it’s important to take your time during this step. When the bun is secure, then the loose pieces of hair need to be twisted together and used to divide the bun into the shape of a bow. Secure the strands so that they won’t come loose, and make sure to pull them tight enough to make sure that the bow’s shape is obvious. This bun looks a lot more complicated than it actually is and is a great way to make a fancy updo for an event without spending a lot of time on your hair. By forming two braids at the same height on the back of your head and then twisting them together, you can easily form this bun. There are a few things to take into consideration when you opt for an easy twisty bun. The first is that you want to use clear rubber bands to secure your braids so that they won’t be obvious when you twist your braids together. You also need to make sure that the ends of your braids are secured inside the bun, not left hanging out, as otherwise the bun will look very messy and unkempt. This type of bun is almost exactly like the bohemian bun, except that it is not as messy as the bohemian bun. While the bohemian bun is formed in a messy chignon with loose strands of hair that are allowed to hang down from the bun all around the head and even around the face, a braid bun is much more ordered, shaped like a donut, and is slicked so that there aren’t any stray hairs that are trying to escape the bun. Once the bun is in shape, then a small braid is coiled around the base and pinned into place so that it can’t move. Both the braid and the bun need to be very neat and styled so that there isn’t any loose hair. A milkmaid bun is a fun way to elevate a regular low bun with a braid. Begin by separating the hair at the back of the head to be used in the bun from some hair that you can use to make the braid. The bun is generally neat and tight, not left to be messy, as the messiness of a bun will compete with the attractive form of the braid. The braid then needs to start on one side of the head and surround the entire head, framing the face, before it is pinned in place underneath the bun. One problem that some people experience with this type of bun is that the braid doesn’t always want to stay in place. You can combat this by using some strategically placed bobby pins to keep the braid from slipping. To really update your braided bun and make a splash with something that will not only keep your hair out of your face but ensure that you look great, opt for a combination of braids that start at the face and a bun. A low bun that is tight and free of flyaways looks great with paired with braids. Begin by braiding two sections of hair, one from each side of the face, and pulling them towards the back of your head. Once you have secured your bun tightly and securely to your head then you can wrap the braids around the bun and secure them at the base. This is just a little more fancy than other, more basic, types of braids and looks great for any occasion. While braids can be very simple and messy for a relaxed look, they can also look very refined and classy. A chic bun that is very low on the neck and rolled into shape rather than wrapped into a doughnut looks amazing. The elongated shape of this bun is not only very attractive, it’s just a little bit different from typical buns, which is sure to attract the attention of anyone who sees it. The most important thing to remember when you opt for this type of bun is that you want to make sure that your pins are all hidden so that they do not stick out and ruin the classy effect that you desire. You can upgrade your normal low bun into something a little bit different by taking a section of hair, twisting it, and then wrapping it around the base of the bun. This clearly defines the bun. Instead of pulling the bun tight to the head and forming it into a doughnut, allow part of the bun to hang down in a loop. This creates a more relaxed appearance without allowing the bun to look messy. Because of this, you can easily wear this bun to most any function without worrying about looking out of place. 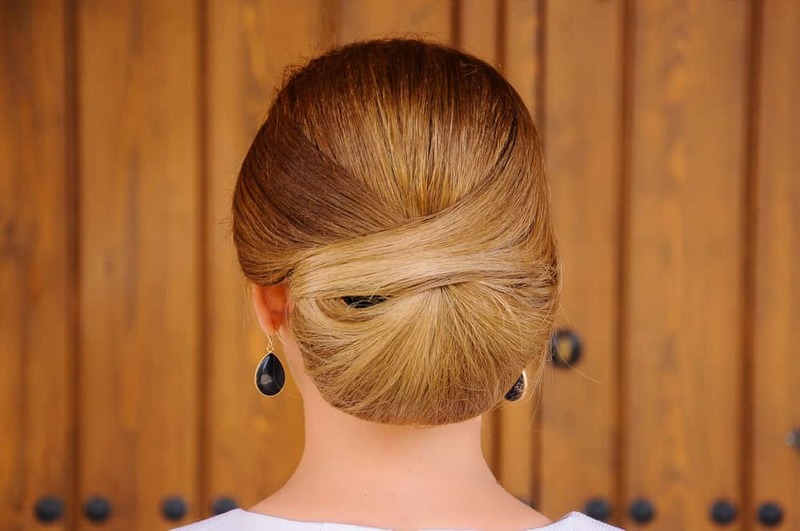 This is easily one of the classiest of all buns that you can do, and it looks great no matter whether you are going to work or are in a wedding. When you are going to style a French twist, you will want to wash your hair the day before, but not the day of, as the oils in your hair will help to hold the style in place. To make sure that your French twist looks the best that it can, you will want to make sure that you carefully smooth any loose hairs into place and keep them from coming loose, which will make the whole hairdo look a lot more casual. If you struggle with doing a French twist and want a little additional help, then there are some great combs on the market that will make this process a lot easier, especially when you are working on your own head. For a more relaxed look that works perfectly both day and night, opt for a bun that has some tendrils of hair that have escaped and are gently resting around your face. These tendrils soften the look and will prevent the bun from looking harsh and unnatural. The best way to make sure that your tendrils add to the beauty of your bun and don’t make it look haphazard is to pull your hair into a bun and secure it before gently pulling out a few tendrils. The tendrils can then rest around your face and will fall naturally. You can use this style no matter what type of bun you opt for, as they will soften the look and make it look more natural. A half bun is when the top part of your hair is pulled back into a bun near the top of your head while the rest of the hair is allowed to hang loose around your shoulders. This is a great option if you want to enjoy a casual look that still looks a bit nicer than having all of your hair loose or if you are worried about hair getting into your face, as you can keep everything pulled away from your eyes. This type of bun is ideal no matter how long your hair is, as you can easily adjust the bun’s location on your hair to ensure that your hair looks the best that it can. It’s a great option for people who have thinner hair, as you can easily curl the rest of your hair and make it look more voluminous. Unlike other types of buns that hold the hair securely, the pony bun is a cross between a bun and a ponytail and allows for a lot more movement from the hair. Once the hair has been pulled into a ponytail, instead of pulling the hair all of the way through the rubber band on the final pass, it is left pulled only halfway through. This keeps the hair off of the neck in the way that you are accustomed to with a full bun, but allows for more movement and is easy to take in and out of your hair. Some of the hair is left dangling out of the bun. If you want to make sure that your hair bun looks the nicest that it can, then you need to make sure that you use jewels or flowers to decorate your bun. These are a wonderful way to quickly make your hair appear much nicer and fancier without a lot of effort. No matter whether you have opted for a loose bun or one that is more secure and doesn’t have any flyaways, when you decorate your bun you are sure to love the way that it looks. Decorations can match the rest of your outfit if you want something that will fit with your style, or they can be a different color if you want something that adds interest without matching. Two buns up on the side or top of the head are very cute and are a fun and easy style to do. These buns look great of people of all ages and are a great way to keep hair out of your face and off your neck. Because the hair doesn’t all have to reach a center point on the back of the head, these buns are ideal if your hair is a little short. You can, with the help of some bobby pins or other clips, easily control your hair and ensure that it goes where you want it to. Twin buns are going to be a lot smaller than other types of buns, but that is part of the charm and appeal. This type of bun is much more intricate than other braided buns, but the end result is worth it. When you have a lace braided bun, then the hair of the bun is actually included in the braid itself. The result is a bun that looks like it was braided onto the head. This is not an easy bun to learn how to do, but with a little practice and patience you can easily accomplish it. This style is perfect if you want an updo that will work for both day and night looks, as it is perfect for an evening out but still looks great at work. 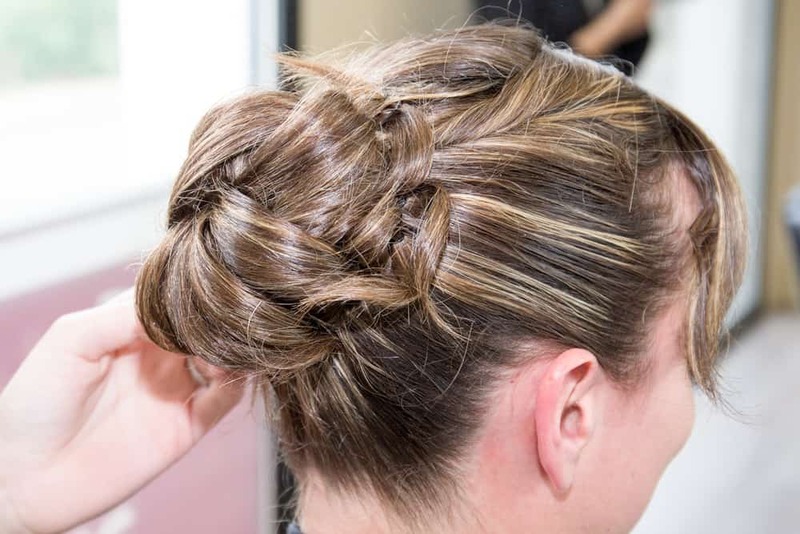 This type of bun stars with a ladder braid down the length of a ponytail and then the bun is carefully twisted into place, making sure that the braid is always visible on the outside of the bun. If you are not careful to place the ladder braid where it can be seen, then you will not get the full effect from this great braid. It’s generally one that you will perform on another person, as it can be very difficult to see what you are doing and have the patience to hold your arms up long enough to finish the ladder braid. A sock bun is a great way to add a lot of volume to your hair quickly and easily. 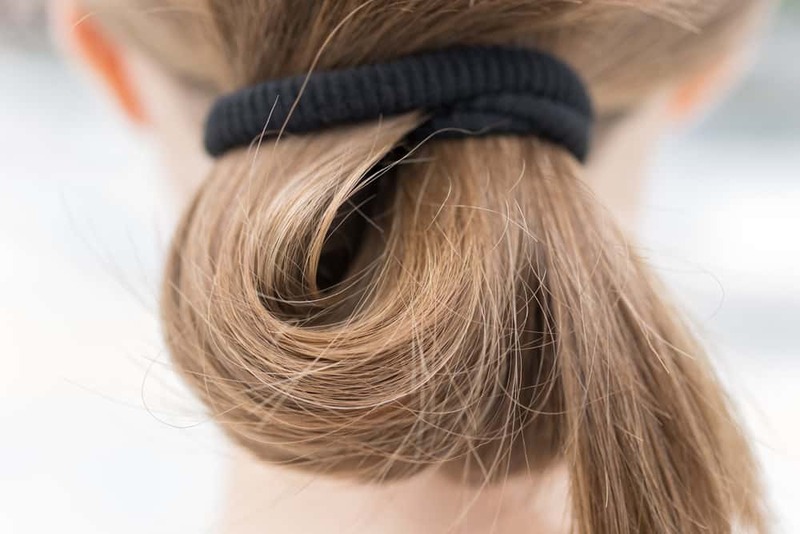 By using part of an old sock to roll up your bun and give it definition, you can quickly create a bun that looks much thicker than it would if you were to only use your natural hair. 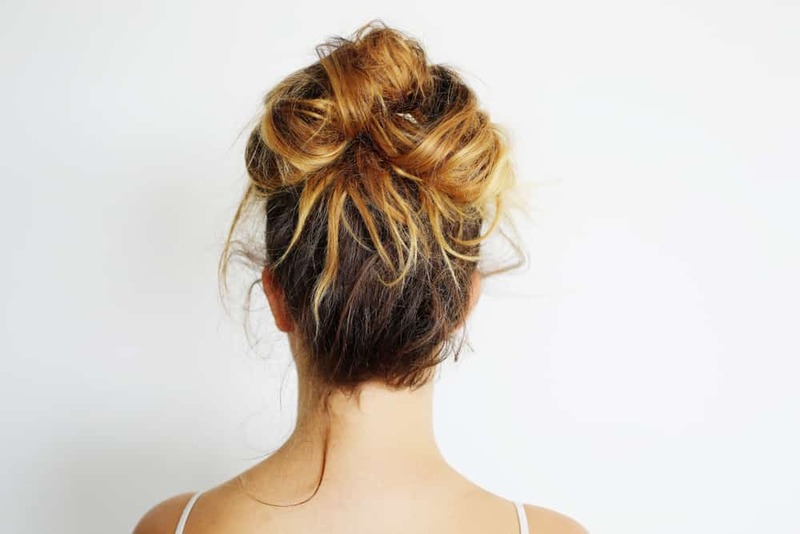 This type of bun is generally a little bit messy, but not as messy or loose as a bohemian bun.